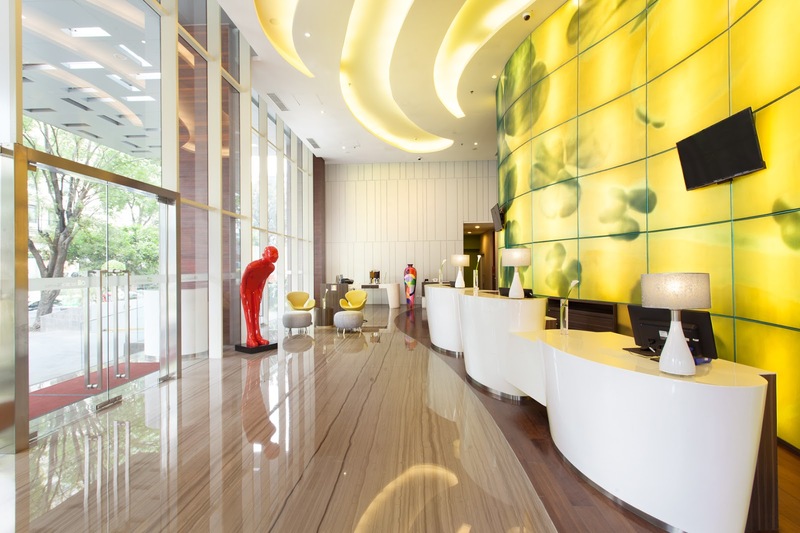 Lobby All Seasons Jakarta Thamrin. Photo courtesy of All Seasons Jakarta Thamrin. I was on the search of a hotel for a weekend staycation in Jakarta, when suddenly an email came in to my inbox. 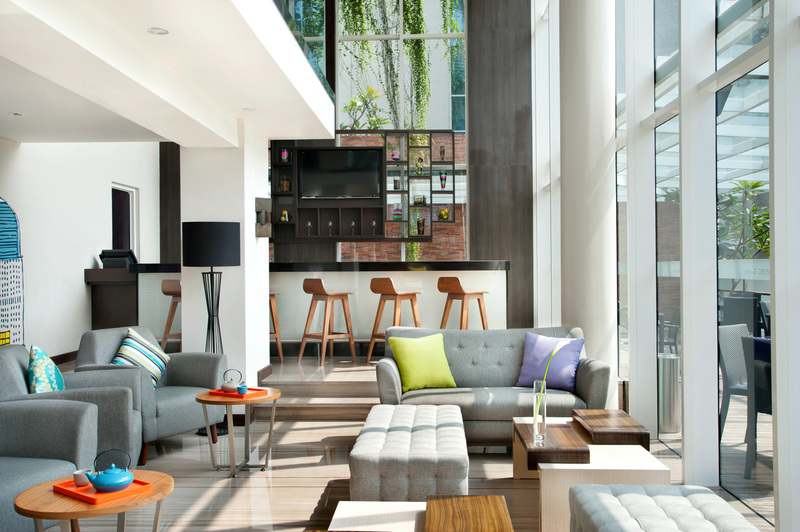 Surprisingly, the email was an invitation to spend a night at All Seasons Jakarta Thamrin hotel. What a coincidence! Then, I stalked them on Google. Turns out the hotel is cute! It's a chained hotel -- a part of Accor Hotels -- but it's styled as a boutique hotel with different wall design in the room, as well as the hip and trendy looking bar and sky lounge. StrEATs Bar at the lobby, where you can chill and relax in the evening. Photo courtesy of All Seasons Jakarta Thamrin. Located in the very heart of Jakarta, among the prestigious shopping malls and hotels, All Seasons Jakarta Thamrin is a little hidden under the shades. The hotel is tucked in an alley, just behind Thamrin Street. It's a walking distance to Grand Indonesia, Plaza Indonesia, and of course one of Jakarta's landmark: Bundaran Hotel Indonesia. For me, the prime but quiet location makes All Seasons Jakarta Thamrin a nice place for a weekend staycation. It's very close with some of Jakarta's major attractions, but away from the noises of the busy streets. It's also a very nice starting point to explore the city if you're a traveler on a holiday. And, another major benefits that's also one of All Seasons Jakarta Thamrin's top selling point because of the location is... the view. For me, it's Jakarta at its best angle. You can get a quite similar view like when you're staying at the five stars hotels in the area, but with a half lower price. Check out these amazing view from my bedroom. The room itself was nice. With a separate bathroom, toilet, and sink, I think it's a nice to keep the toilet dry -- and if someone wants to go for the "nature's call", the other person in the room can still take a bath in a separate door. While the bed itself, it was very comfy and what came to my surprise was.. they even provide bolsters! Very shocking because I haven't found any other hotels equipped the bed with bolsters before. One of the most exciting part of the hotel for me when I Google-d it was Skyloft, the restaurant/sky bar area, with those big windows, showing Jakarta from it's best view. I'm kinda obsessed with big windows so I was so excited to see it. So the next day, during the breakfast time, I was thrilled to finally see them with my own eyes. And yes indeed, the view was amazing. It's like the best spot to see Jakarta at its best angle. Super love. The food, however, could've been better. Variety wise, it was decent. They got Italian food, standard American buffet breakfast menu, as well as Indonesian menu. I just wish they put a small stove to keep the food warm all the time. So guest who come late in the morning can still enjoy a warm meal. After finishing the breakfast, I'd suggest you to go outside the restaurant. You'll see this beautiful outdoor area overlooking the tall buildings of Sudirman and Thamrin. Even more picturesque. And you know what the good news is? Skyloft is open for public for lunch and dinner, and even for breakfast! You can enjoy the buffet breakfast from 6-10am (weekday, until 11am for weekends), 12-3pm for lunch, and 6-11pm for dinner (or until midnight for Friday and Saturday).